The idea of a family road trip may be more fun than the actual road trip itself. Long hours in the car quickly wear on both parents and children. However, having some activities that the kids can enjoy will make for a more pleasant trip for everyone. Click to print this game. Paper dolls can be a lot of fun for the girls, but when you want an inexpensive toy for boys and girls, this packable suitcase is the perfect solution. 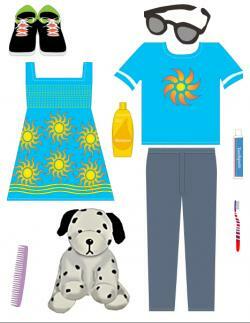 The printable is a small suitcase and the items that a child might pack to go on a trip. Print the two pages on card stock for a sturdier toy. Cut out the suitcase and the individual items meant to go inside the suitcase. If you want, you can laminate the pages after they are cut out. This will help ensure the toy lasts the entire trip and maybe even beyond. This game is best suited for preschool through about ten years of age. This toy can be used in a variety of ways, making it one your children will treasure. Print two or more copies and challenge the kids to see who can get all the items neatly arranged in the suitcase the fastest. Print a second page of the items and glue them to index cards. Have the children take turns drawing cards and placing the items into the suitcase. Challenge the children to find the item on the trip and then put it in the suitcase. For example, if the child sees a dog on the side of the road, he can add the stuffed dog image to the suitcase. If he sees a woman combing her hair in the next car, he can add the comb and so on. This turns the toy into both a scavenger hunt and paper doll game, and it will keep children busy for much of the trip. Print this bubble wrap game. Who doesn't love popping those clear bubbles on bubble wrap? 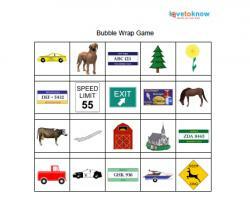 You can create a simple car game out of large bubble wrap (one-inch bubbles) and this printable. Because the game uses images, any child preschool age or older can play. Print out the images on a piece of card stock. Cut a piece of bubble wrap to fit over the sheet of images. Seal the edges of the bubble wrap and the piece of card stock together with clear packing tape. Each child receives a bubble wrapped card. Challenge the children to find each of the images on the card. For example, if there is an image of a cow, they should look for a cow. When they find one of the items, they should call out what they saw and pop the bubble. Only the first person to spot that image can pop it. The others will have to wait to see another object. Once the child has called out "cow" or whatever the object may be, he can no longer call that item. This gives every child a chance to find all the items on his card. The first person to pop all the bubbles wins the game. Click to print the scavenger hunt. 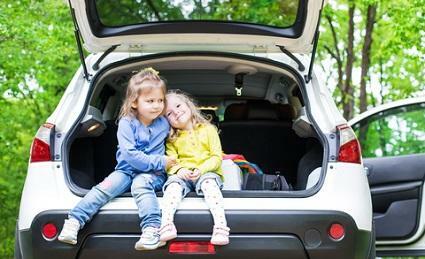 Keep your kids entertained during those long road trips by giving them the scavenger hunt list to the right. The items included are things that the child will need to look for both while in the car and at stops along the way, such as restaurants. This game is better suited for older children who can read well. Print enough copies of the scavenger hunt list so that every person playing can have one. You may want to print a few extras in case someone makes a mistake on their copy. Gather enough washable markers or pens for each player. Instruct children that they must either spot the item or complete the task. As they do so, they should mark off that item on the scavenger hunt list. Each item is worth two points and points are tallied at the end of the trip. Almost every fun Internet site devoted to kids has an accessible subcategory of free printable games and activities. Check out the following sites for a wealth of free activities and stock up on the printer paper! 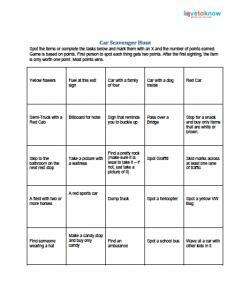 MomsMinivan has a ton of free printable games, including roadside bingo, scavenger hunts, Battleship, sing-along song lyrics, and Tic-Tac-Toe. For parents who want to make fun as educational as possible, familyeducation.com is a must visit. With over a thousand free activities, he's sure to learn plenty while enjoying his travel time! Activities include things like, Nouns: What Is It, Ocean Concentration Game, Color By Number, Hidden Summer Vacation, Flash Cards, and Most Common Words Cards. The "I Spy" Printable Car Game is a good choice for travel as well. The Kidz Page is a bustling, fun-filled site that has plenty of printable games including jigsaw puzzles, coloring pages, and holiday themed activities. You'll even find word search printables with holiday themes, which is perfect for that seasonal road trip to Grandma's house. Once you have a vast selection of activities, it's time to pack a travel sack for easy stow-away and access. A backpack devoted to travel games and supplies will help to keep all the fun organized. For easy access, file activities in folders and sort them in folders titled coloring activities, puzzles and mazes, and learning fun. Make sure your child has plenty of pencils, sharpeners, markers, and crayons packed away to keep her busy! To add to the anticipation of the travel games and activities, keep them hidden until departure. While transportation traveling may only take a few hours or a couple of days, these games are sure to keep your child busy throughout the entire family trip!